The name should represent the aim of your algorithm. The name should not contain spaces: THIS IS NOT A GOOD ALGORITHM NAME. If the name is to consist of several words, you may fill the gaps between the words with underscores: THE_ALGORITHM_NAME_SHOULD_BE_CONTIGUOUS. Ideally, the algorithm name should start with a letter and contain only letters, digits and underscores (identifier syntax). Also make sure to fill in the lower text field (superscribed "Comment") with a description of what the algorithm is good for and how to use it. The framing (or root) element of a Nassi-Shneiderman diagram represents either a program, a (callable) subroutine, or an includable diagram (also see Type setting). A program means a standalone algorithm (an application) as being executable as a process on the operating system level. It usually communicates with the user via input and output instructions. functions, supposed to return a result (usually without further impacts or side-effects). 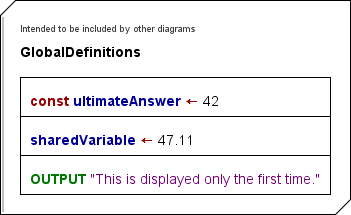 An includable diagram (as introduced with release 3.27) is typically a collection of constant definitions, type definitions, and declarations of variables, which are to be shared e.g. among a main diagram and some of its subroutine diagrams. 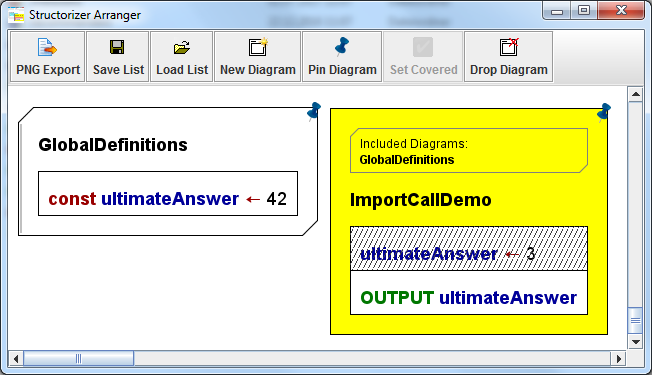 In order to get hold of the defined data, a diagram must include the includable diagram by adding it to its include list, which is accessible via the button "Diagrams to be included" near the bottom of the editor (see screenshot above). 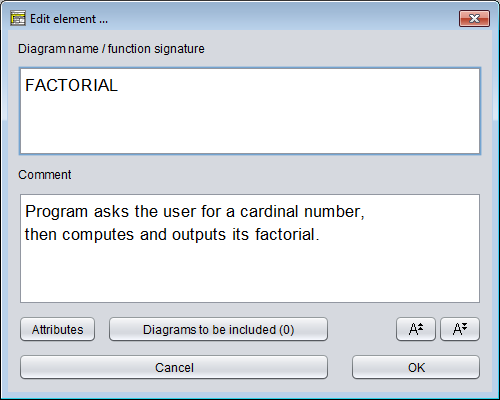 In versions prior to release 3.29 the list had been editable in a faintly yellowish upper text field superscribed "Diagrams to be included" above the "Diagram name / function signature" text area. an includable diagram has two bevelled corners. How to set the type of the diagram? Just select the appropriate one of the menu items "Diagram => Type => Main" / "Diagram => Type => Sub" / "Diagram => Type => Includable" (see screenshot) or one of the toolbar buttons boxed red in the screenshot (cf Settings/Type). When you start with a new diagram, it will initially be a program. The following images show you the computation of the factorial both as a program (left) and as a function (right). Note that the assignment to variable result is one of three supported value return mechanisms (see last paragraph below). 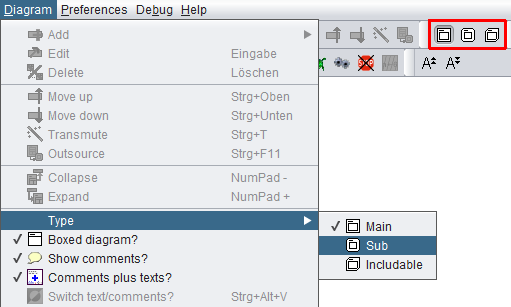 If the diagram is a program (or an includable diagram, only versions ≥ 3.27) then the text field is supposed to contain just its name. A program name should be an identifier as described above, i.e. a word consisting of letters, digits, and underscores, beginning with a letter or underscore. It should not contain blanks. A subroutine header, however, is supposed to contain more information than just the name. 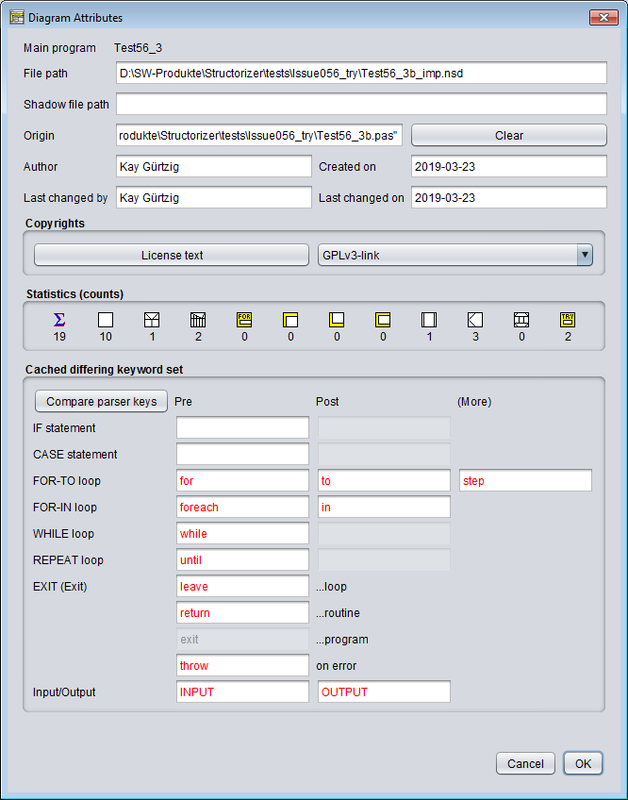 The subroutine name (an identifier as described above) is to be followed by a parameter list. A parameter list - in its simplest form - is a pair of parentheses containing a series of parameter names, separated by comma or semicolon (see example above). It may have Pascal syntax (where each parameter name is followed by a colon and a type name. The parameter specifications are to be separated by semicolons. If several parameters are of the same type, they may be grouped to a comma-separated list of their names, followed by the common colon and type name; note the semicolon between parameter groups! The result type - if any - follows the parameter list, separated from it by a colon), e.g. Alternatively, it may have C/Java syntax (where the name of any parameter follows its type name; all parameter specifications are separated by commas, a grouping of parameters of the same type is not possible, semicolons are not allowed; the result type precedes the function name), e.g. All three forms will be accepted by Structorizer and converted into proper function headers on code export if possible. Structorizer allows so called overloading of subroutines, i.e. several subroutines may have the same name, provided their parameter numbers differ. Since typing of parameters (and variables in general) is not mandatory and not even consistently forced if types are specified, Structorizer does not attempt to distinguish argument lists by argument types. Only argument numbers make a significant difference. Be aware, however, that parameter order matters: This first argument value of a call is always assigned to the first parameter variable of the matching subroutine and so forth (argument assignment by position). 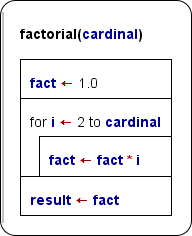 Add a return instruction (like in C, Java, and the like; modify the last line in the above example to: return fact). The first two of the opportunities allow to override a provisionally assigned value by subsequent instructions such that just the last performed assignment to the function name or result variable will be the final result, whereas a return instruction will immediately force the termination of the subroutine with the attached result wherever it may occur and be executed. You should not employ more than one of the three result mechanisms described above within the same diagram, otherwise the result may not be what you expected it to be. 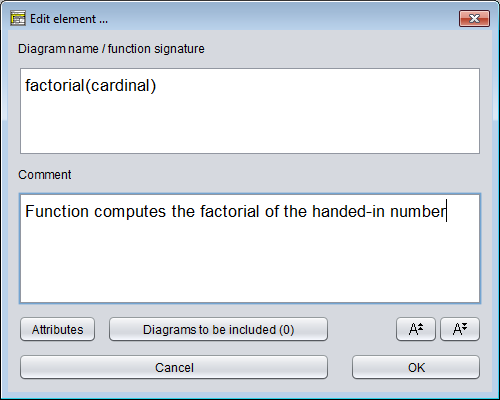 Note that mechanism 1 will cause Analyser complaints if option "Check that the program / sub name is not equal to any other identifier" is enabled in the Analyser Preferences. creates a subroutine diagram with matching interface if it hadn't existed before and opens it for editing. extracts the selected elements from the current diagram and converts the sequence into a subroutine, infering the required arguments and return values and replacing the sequence by a matching CALL element. See CALL elements for details. 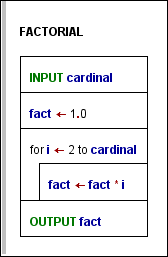 it is executed at most once - from the first executed diagram that holds it in its include list. in order to be able to introduce compound types (aka record, struct), which require a definition possibly having to be shared between a calling diagram and a called diagram if the argument list happens to contain a parameter of such a record type. it drastically limits the general usability of the algorithm. Ideally, the diagrams to be included (the "includable diagrams") should only contain constant definitions and type definitions, and - if inevitable - variable declarations, variable initializations, and the like. 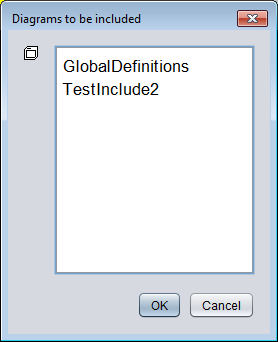 The following example demonstrates that the constant ultimateAnswer defined in diagram "GlobalDefinitions" is recognized and therefore highlighted in the importing diagram "ImportCallDemo" as if it were introduced by the importing diagram itself (which is not the case because the preceding assignment "ultimateAnswer <- 3" is disabled - if it were enabled you would be warned of an illegal attempt to modify a constant). Another aspect is that included diagrams may (of course) in turn include other includable diagrams. But there must never be a cyclic inclusion (e.g. diagram A includes diagram B, which in turn includes diagram A)! Analyser and Executor do their best to detect and avert such a cyclic inclusion, however. 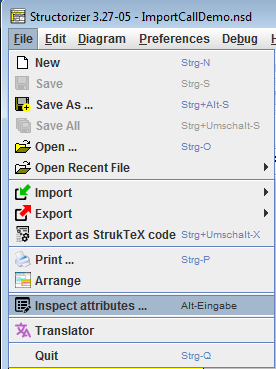 Since version 3.28-08, you may also activate the Attribute Inspector for any diagram located in the Arranger via the context menu of the Arranger Index (provided a diagram node is selected) or the Arranger itself.